Survivor: South Pacific (2011) - 8th place, 13th out - 5th juror. Voted out in Episode 11, "Cult Like" (Day 30). Eliminated by Ozzy Lusth (in a duel) in Episode 12, "Ticking Time Bomb" (Day 31). Survivor: Caramoan - Fans vs. Favorites (2013) - Winner, 8-0-0. Received all eight jury votes to win unanimously, in Episode 14, "Final Push" (Day 39). South Pacific Ep.1 IC: "Coconut Conundrum" - participates, but Savaii narrowly loses. South Pacific Ep.2 RC/IC: "Crate Escape" - Savaii wins. South Pacific Ep.3 RC/IC: "Hitching a Ride" - Turns wheel, Savaii loses. South Pacific Ep.4 RC/IC: "Shoulder the Load" - Loader, Savaii wins. South Pacific Ep.5 RC/IC: "Pig Out" - Savaii can't gnaw as much spit-soaking pork as Upolu, and loses. South Pacific Ep.6 RC/IC: "Losing Face" - Wheelbarrow duty, Savaii wins. South Pacific Ep.7 RC/IC: "Family Ties" - Gets blamed by Probst and his tribe (unfairly) when Savaii loses. South Pacific Ep.8 IC: "Coconut Cradle" - First man to drop out (8th/8). South Pacific Ep.9 F11 IC: "Get Crackin'" - Eliminated in the first round (bottom 7/11). South Pacific Ep.9 F10 IC: "Bow-Diddley" - Opts to sit out and eat pastries, instead of compete (tie-10th/10). South Pacific Ep.10 F9 IC: "Price on Your Head" - Not particularly close to winning (bottom 6/9). 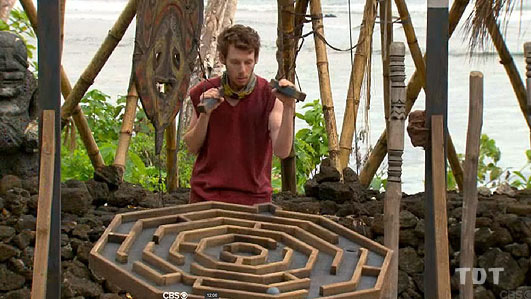 South Pacific Ep.10 F8 IC: "Challenge At Tribal (CAT)" - With Brandon, eliminated on the 2nd question (tie-4th/8). 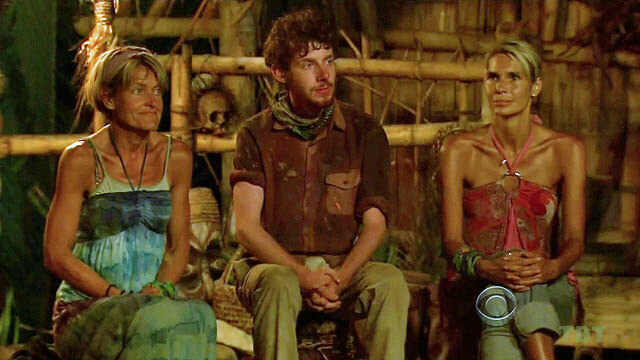 South Pacific Ep.11 IC: "Deja Vu" - Just misses reaching the second round (tie-4th/7). Caramoan Ep.1 RC: "Water Slaughter" - With Francesca, beats Matt & Laura, and eventually, Bikal wins. Caramoan Ep.1 IC: "A Long Way to the Top" - With Phillip, tosses crates from the first floor; Bikal eventually loses. Caramoan Ep.2 RC/IC: "Plunge, Pull & Pop" - With Corinne & Brandon, one of three Bikal pullers. Bikal wins. Caramoan Ep. 3 RC/IC: "Cell Block Sea" - Competes, Bikal wins again. Caramoan Ep. 4 RC: "Head and Shoulders" - Sits out but gets reward, as Bikal wins again. Caramoan Ep. 4 IC: "Smash & Grab" - With Phillip, in charge of locks, then lets Phillip toss, and Bikal wins. Caramoan Ep. 5 RC: "Nut Bucket" - Shoots baskets for Bikal, and Bikal wins. Caramoan Ep. 6 IC: "Crate Outdoors" - Now switched to the new Bikal, which promptly starts losing. Caramoan Ep. 7 RC: "Hot Pursuit" - Second Bikal to unclip, with Dawn & Julia, but Bikal still loses. Caramoan Ep. 7 IC: "Phoenix Rises" - One of the nebulous pullers/arrangers. Bikal loses again. Caramoan Ep. 9 RC: "Jump Shot" - Part of the winning team (with Eddie, Reynold, Michael, Erik). Caramoan Ep. 10 RC: "Muddy Waters" - Part of the winning team (with Erik, Phillip, Dawn, Reynold). Caramoan Ep. 8 IC: "Caramoan Catering" - Cochran wins! (1st/12). Caramoan Ep. 9 IC: "Last Gasp" - Eighth person to drop out (4th/11). Caramoan Ep. 10 IC: "Keel Hauling" - Eliminated in first round, fourth or fifth in his heat (4th/5). Caramoan Ep. 11 IC: "Drop A Log" -Thanks to the advantage he purchased, gets two extra knots, and wins (1st/9). Caramoan Ep. 12 F8 RC/IC: "Bermuda Triangle" - At the 15-min mark, jumps down to eat hot dogs and soda (6th/8). Caramoan Ep. 12 F7 IC: "Fun Climb" - With a whopping 3/10 puzzle rungs placed, gets third (3rd/7). Caramoan Ep. 13 RC: "Loved Ones Dizzy Gillespie" - Doesn't win, but given reward by Brenda (bottom 5/6). Caramoan Ep. 13 IC: "I Hold On" - First person to drop out, after 15 minutes (6th/6). Caramoan Ep. 14 RC: "Teeter Tower" - Cochran wins, giving himself advantage in the next IC (1st/4). Caramoan Ep. 14 IC: "Vertically Challenged" - Loses most of his advantage on the puzzle, but still wins (1st/4). South Pacific, Ep. 3: 'Papa Bear' Caruso (voted out, 6-1-1). South Pacific, Ep. 5: Elyse Umemoto (voted out, 3-2-2). South Pacific, Ep. 7: Ozzy Lusth (voted out, 5-1). South Pacific, Ep. 9 (F11 vote): Ozzy Lusth (voted out again, 9-2). South Pacific, Ep. 1: One vote, from Semhar. South Pacific, Ep. 3: One vote, from Jim. South Pacific, Ep. 5: Two votes, from Ozzy and Elyse. South Pacific, Ep. 7: One vote, from Ozzy. South Pacific, Ep. 9 (F11 vote): Two votes, from Ozzy and Jim. South Pacific, Ep. 10 (F8 vote): One vote, from Whitney. South Pacific, Ep. 11: Five votes, from Sophie, Coach, Albert, Rick, and Brandon (voted out, 5-2). South Pacific, Ep. 14: Voted for Coach Wade (who finished second, 6-3-0). Caramoan, Ep. 2: Francesca Hogi (voted out, 6-4). Caramoan, Ep. 5: Brandon Hantz (voted out, 8-1). Caramoan, Ep. 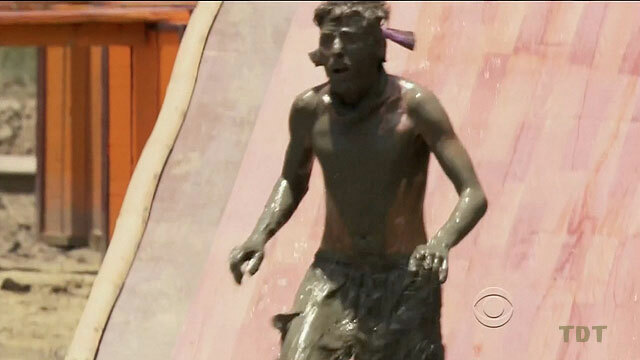 6: Matt Bischoff (voted out, 4-2-1). Caramoan, Ep. 11: Malcolm Freberg (voted out, 3-3-3 [6-0 on re-vote]). Caramoan, Ep. 14: Received all eight jury votes, and won, 8-0-0. Ozzy is on my tribe. Freakin' Ozzy! Listening to Probst describe the 'Hero challenge,' Ep1. With Freakin' Ozzy. I hope you're still good at challenges, old man. I'm in law school... at Harvard. Broing down with Keith, Ep1. The start of a beautiful friendship. Getting to listen to Brandon at the Ep9 final 10 Tribal Council. Fun! Answering one question right? Good enough for fourth place with this group. Getting to read the first IC treemail to Bikal. Yay. Two seasons, two straight Ep1 Tribal Councils attended. Night three, watching Brandon yell at people. Good times. Yes! One crate in the wrong place! Woo! Another day, another throne. Sigh. What can you do? Underway, in hot pursuit of the new Gotas. More or less. Not to worry, Julia, Phillip has this whole racing thing figured out. Apparently. At least new Bikal made voting off the fans somewhat interesting, right? John M. Cochran has won immunity! The Giants have won the pennant! Who's a liability now, Keith? To be accurate, you're standing, Phillip. Also choking me. They think they've got me eating out of the palms of their hands. Joke's on them, it's the fingers. Still in it, Ep11 IC. Having an advantage has its advantages. Good try, bro. Maybe next time you can give it 110%, or some other sports cliche. Back at Tribal Council, Ep11. So long, Malcolm. This would be where we don't say anything about Cochran's mom. Got it. Mainly for thus far avoiding machete-related injuries. But also the running-the-game part, probably. Our most sincere requests for your beneficence, Brenda. Getting a hug from dad, who is probably also proud of the dearth of machete-related incidents to this point. Yup, third individual challenge win. Pretty much Ozzy. Is it okay if I call you Colby? You've won four challenges now. Can I offer you the keys to my car? My vacation home in Maui? Dinner at 8? Gordon Holmes at XfinityTV.com (8/22/11): "Pre-Game Interview: John Cochran"
Gordon Holmes at XfinityTV.com (12/8/11): "Castaway Interview: John Cochran"
Rob Cesternino at RHAP (12/8/11): "John Cochran Settles All the Survivor: South Pacific Debates"
Daniel Fienberg at HitFix.com (12/10/11): "John Cochran talks Survivor: South Pacific"
Gordon Holmes at XfinityTV.com (2/5/13): "Cochran: 'They're Going to See a Different Guy'"
Dalton Ross at EW.com (1/16/13): "John Cochran says 'I bring virtually nothing to the table'"
Dalton Ross at EW.com (5/13/13): "John Cochran explains how he won Survivor: Caramoan"
Rob Cesternino at RobHasAPodcast (5/13/13): "Talking with the Winner and the Final 5 From Survivor: Caramoan"
Gordon Holmes at XfinityTV.com (5/13/13): "Survivor Champion John Cochran - 'I Thought Dawn Could Beat Me'"
Daniel Fienberg at HitFix.com (5/16/13): "John Cochran discusses his Survivor: Caramoan win"
"John Cochran says: 99% of my game plan is adaptability. I like having the appearance of talking about my insecurities or embarrassing stories, not to the extent that people are annoyed by it. The more open you are with people, the more open they are with you. I will be calculating in what I will reveal. Jeff [Probst] says: He's hilarious." "Allow the Woody Allen-ish Harvard law student (who five minutes into the game instructs Probst to refer to him by his last name only) to tell you why he's destined to take home the title. 'I will win Survivor because I am a student of the game, unlike any other player that's played the game before. I've never missed a single episode. I used to do a newsletter in high school and wear a buff around my arm every Thursday, now it would be Wednesday. My senior yearbook picture was me wearing three buffs, two around my arm and one around my forehead, and a Survivor T-shirt. This has been ingrained in me for 11 years. This is the culmination of a lot of obsession.' And how!" "Personal claim to fame: I won the Dean's Scholar Prize at Harvard Law for an essay I wrote on the Survivor jury system. It was one of the few times in my life where my personal interests and academic obligations coincided perfectly. Pet peeves: People who think or act like they are smarter than they actually are and people who don't have a sense of humor. Reason for being on Survivor: My respect and admiration for Survivor and my desire to make it even better. My secondary motivation is to experience some adventure and excitement in my life during a time when I otherwise feel like I'm on autopilot. Why you think you'll 'survive' Survivor: I have a strong sense of humor that can defuse tense situations and an ability to listen to conflicting viewpoints and devise a rational compromise that is satisfying to all parties involved. I also have a slender frame that doesn't take up much space in a crowded shelter. Why you think you will be the sole Survivor: I understand other people and how they function. Sure, I'm bright and have an extensive knowledge of Survivor, but none of that does any good unless you're able to figure out the reasons why other people do the things they do. Not only can I do that, but I'm also confident that I can leverage their desires and motives in a way that best serves my game." If You Could Have 3 Things on The Island What Would They Be and Why? 1) Frisbee - It’s fun and doubles as a dish. 2) Cards – To pass the time. 3) Sketchpad – I like to doodle! Why You Think You’ll 'Survive' Survivor: I’m too passionate about Survivor to let harsh elements, starvation, sleep deprivation and abrasive tribe mates deter me from lasting all 39 days. Why You Think You Will Be the Sole Survivor: Having played once before, I know the sorts of mistakes I’m susceptible to making. I didn’t win the last time I played and I have no desire to repeat history. I still know more about Survivor than virtually anyone else who’s ever played the game. Now I feel more mentally and psychologically prepared to put my theoretical knowledge of the game into practice. "